The ghosts are jamming again. They're playing that hot jazz in the Turkish Embassy's old Sheridan Circle mansion, just as they did in the 1930s and '40s, when the ambassador's boys, Ahmet and Nesuhi Ertegun, were always inviting their favorite musicians over to hang and blow and thump. 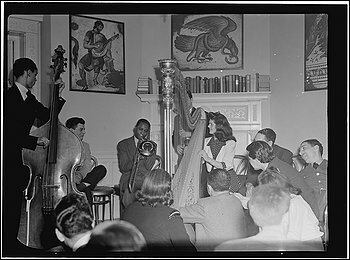 The informal, integrated gatherings achieved near-mythic status - "Washington's most famous private jam sessions," jazz journalist Bill Gottlieb called them in The Washington Post in 1943 - and then they evaporated into history. "So many people don't know about it," said Namik Tan, Turkey's current ambassador. He's in the mansion's second-floor music parlor, envisioning Lester Young sitting in the wood-paneled room, coaxing those light, airy notes out of his tenor saxophone. Or maybe it's Benny Carter, making his alto sax sing. And aren't those the cats from Duke Ellington's band - Johnny Hodges, Harry Carney, Barney Bigard - on deck to play? "Just try to scan back and imagine sitting here and listening to those great jazz musicians play," Tan said. On Friday, in a nod to Black History Month, Tan will announce a series of six invitation-only concerts at his palatial residence just off Embassy Row. The first, March 1, will feature pianist Orrin Evans. Jazz at Lincoln Center, on whose board Ahmet Ertegun served, is curating the series, which Tan conceived to highlight the mansion's past as one of Washington's most exclusive - and unlikely - jazz venues. These will be much more formal affairs than the jam sessions hosted by the brothers: Ahmet, who founded Atlantic Records and produced some of R&B's greatest sides; and Nesuhi, who ran the jazz department at Atlantic and produced classic records for John Coltrane, Ray Charles, Bobby Darin and Roberta Flack. But any jazz is notable at 1606 23rd St. NW, where the Erteguns proudly flouted the conventions of segregated Washington by welcoming black musicians through the front door. This was done, as Ahmet Ertegun liked to point out, much to the consternation of "outraged Southern senators," who complained to his father, Ambassador Mehmet Munir Ertegun, about the practice. The Ertegun boys were already hard-core swing buffs by the time their father was named Turkey's ambassador to Washington in 1934, when Nesuhi was 17 and Ahmet was 11. Upon landing in America, the young Turks dived headlong into the heart of the District's hopping jazz scene, frequenting the Howard Theatre, a mecca of black entertainment, to hear Ellington and other favorites. "I got my education in music at the Howard," Ahmet later declared. The Erteguns began promoting concerts, too - at the Jewish Community Center, the National Press Club and elsewhere - partly because they so loved the music but also out of a sense of social responsibility. "You can't imagine how segregated Washington was at that time," Nesuhi told The Post in 1979, a decade before his death. "Blacks and whites couldn't sit together in most places. So we put on concerts. . . . Jazz was our weapon for social action." They regularly invited musicians back to the embassy. The typical gathering began with a meal served by servants in tuxedos. Then came the sweetest dessert for hard-core swing fans. "Nesuhi and I made the most out of the extra-territorial situation offered by the embassy by inviting musicians who'd played in town the night before over for Sunday lunch," Ahmet recalled in his 2001 book, "What'd I Say: The Atlantic Story." "They all loved the idea of having lunch at an embassy, particularly one as well-appointed and in such grand surroundings as the Turkish embassy in Washington. After lunch, jam sessions would inevitably develop." If there's a record of the artists who visited the Erteguns, the embassy hasn't been able to find it. Based on interviews with the brothers, Gottlieb's columns in The Post and photos at the Library of Congress, though, the cumulative guest list probably included Young, Carter, boogie-woogie pianist Meade Lux Lewis, blues giant Leadbelly, and members of the Count Basie and Ellington bands. You can feel it when you set foot in the place, said Washington jazzman and educator Davey Yarborough, who performed at the residence in October in what Tan called "a practice for the series." "You feel the history coming up the steps," Yarborough said. "There's a sense of energy, a sense of ancestry that you get to absorb. If Lester Young played here, his spirit is still here, and he might guide me through a breakthrough on my instrument - like, 'Here, let me show you what it really felt like. 'â€Š"
To Nesuhi Ertegun, watching Ellington's band jamming at the mansion "was one of the biggest thrills of my life," he told The Post in 1979.